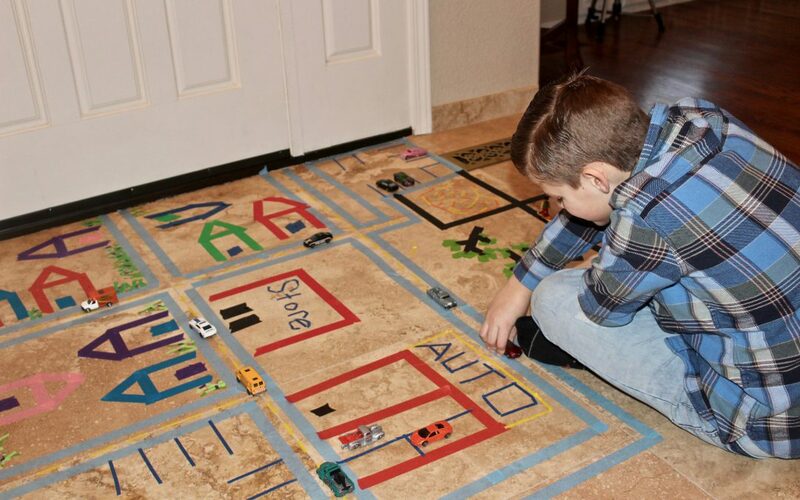 Build a masking tape town and keep your children happy and busy for hours! 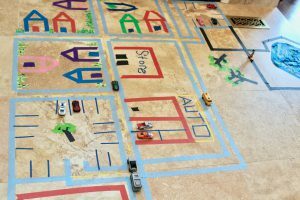 Kids ages 3 and up can design and build this city with nothing more than masking tape, toys cars and people, and a flat surface. This is a great activity to encourage creativity, organization and cooperative play. If you are looking for ways to exercise fine motor skills, then this one is for you! Keep reading and learn how to build a magical masking tape town. Tape is a very practical item. Moms and Dads use it for all sorts of important tasks, and so do kids. I’m always looking for my tape, and guess who usually has it? Yup, the munchkin squad! They are constantly stealing my tape, and when they use it, they use a lot of it. Kids love tape almost as much as they love popsicles and puppies! Even the boring clear tape gets a workout in our house. Why? Because it’s sticky, you can make cool stuff with it, and, well… it’s sticky! The problem that my family encountered with masking tape was that the color options were limited, and any color besides beige was rather expensive. Now, what kid is happy living a “beige” life? We needed some color, so our family did some research and testing and we developed BAM! Tape™ colorful masking tape. This tape makes a kid’s taping dreams come true! It comes in 10 beautiful, bold and brilliant colors and the rolls are huge, so there are no worries about running out of a color before a project is complete. This masking tape comes off the roll easily, so my kids don’t spend a bunch of time trying to peel it off without leaving half of the strip behind. Enough about the tape, let’s build that city! You may want to start with a general design, or perhaps you just want to hand over the tape and see what happens. I tend to start with asking my kids to agree on a plan for the type of town that they are building. Think of it as the Planning and Zoning Committee. You can have each child be responsible for certain aspects of the city, or perhaps each child will be in charge of their own neighborhood. Think builder, road engineer, landscaper, etc. We have several large, flat, open floor spaces, so we start by choosing an area and then I send them off to create the plan. Mom tip: I like to have my kids build in an area near my work area so that I can get my stuff done and still keep an eye on the construction zone. Once the planning is done, then it is time to get out the tape! We use several colors so that details such as ponds, trees, grass and flowers really stand out. Use the walls to add dimension to the town. I have found that it is best to start out by taping down the roads, then add the buildings and finish with the details. When they have the town all taped up, don’t put that masking tape away. There may be some additions needed later on. Now that you have the masking tape town built, it is time to bring in the people and vehicles. My kids populate their towns with small cars, like Hot Wheels, and they use people from their building sets. We also add small animals from their plethora of small and painful to step on toys. Here is where you get to sit down and read a book, or do some laundry! Once they get going, my kids will keep their town alive for hours. Sometimes they even take on roles such as police chief, mayor or local mechanic. You can expand on the masking tape town theme and build other types of places. Build a jungle, a fairy garden or perhaps an old western town. So many options! Here’s what you want to hear: Clean up is a snap! When you are finished playing with your town, simply send all the people back to their very organized bins, (or shove them back under the bed) and pull up the tape. That’s easy! I hope that you and your crew have an enormous amount of fun when you build your masking tape town. The really cool thing about a BAM! Tape™ masking tape town is that you can do it again and make it different enough to keep it interesting and fun. If you have a rainy day to fill, or just a quiet day at home, this activity is sure to please. Please remember that children under 6 years old should always be closely supervised when using tape. Tape is pretty, but it isn’t food and could cause an airway obstruction if children put it in their mouths. Always check to be sure that a surface is safe for tape application before you start your project. Test in an inconspicuous area first. To avoid damage do not leave tape on a surface for an extended period of time. Have fun, and please share your masking tape town ideas in our comments section.